An interesting illustration can be found in the National Nuclear Power Plan prepared by METI (Ministry of Economy, Trade and Industry ). The power supplied by a single nuclear power plant of 1 million kW class is compared to other sources of electricity. Solar cell arrays would require the area within the Yamanote JR Line in central Tokyo (approx. 67 km2), and wind power generation would require 3.5 times the area within the Yamanote Line (approx. 246 km2) to supply the same power. In reality, however, nuclear power plants require vast surrounding areas to safeguard against accidents destructive to the community. The Chernobyl accident resulted in an enforced 30-km radius (approx. 707 km2, 10 times the area within the Yamanote Line) of prohibited entry. A vast evacuation zone was actually established after the Fukushima nuclear accident also. Under the original design, the perimeter of a nuclear power plant must maintain a non-residential buffer zone of sufficient area. In Japan, however, because of its small landmass, such zones were omitted, based on the assumptive decision that serious accidents would not occur. In this context, nuclear power generation policy in Japan is strained. The incidence of accidents provides a typical assumptive condition. Up until the 2000’s, on-site nuclear reactor education held that accidents occurred once every 10 million years, which was believed as true. This approach was probably based on Rasmussen’s 1975 report, which provided that catastrophic accidents occurred once every 1 billion years. Based on precursor methods for estimating the incidence of large accidents from the numbers of small accidents, however, calculations re-examined in the 1980s provided a probability of once every 435 to 6,250 years per nuclear reactor. With 430 nuclear reactors around the world, 6,250 reactor years divided by 430 reactors equals approximately 15 years, an incidence far greater than previously considered. In fact, one reactor at Three Mile Island, one reactor at Chernobyl, and three reactors at Fukushima Dai-Ichi (or considered one in the aggregate) have sustained major accidents within the span of 40 years, an average of once every 8 years (or 15 years). Forced logic also highlights the cost estimations . [2,3] A well-known issue is the exclusion of pumped storage power generation, a necessary device for storing electrical power, since nuclear power plants cannot be shut off at night. While the construction of the nuclear power plant may cost approximately 300 billion yen, the pumped storage power generation facility costs approximately 500 billion yen. The cost accounting by METI, however, included pumped storage power in hydropower generation, and gave nuclear power generation the lowest cost (5.4 yen/kWh) and hydropower generation the highest cost (13.3 yen/kWh). The combination of nuclear power and pumped storage power is 10.13 yen, higher than thermal power at 9.8 yen. The subsidies to promote nuclear power policy, the processing of radioactive waste, reactor decommissioning, compensation for accidents, etc., are a host of expenses that makes the cost of nuclear power generation non-competitive to power generated from fossil fuel sources. The nuclear fuel cycle is considered necessary to lower nuclear power plant costs, but disposal of high-level radioactive waste generated during processing faces a brick wall. Plans call for sealing the waste in glass and disposal underground, but currently, only one out of several pieces of vitrified waste actually made is successfully sealed. In France, a two-step processing technology has been supposedly completed, where radioactive waste solution is dried and oxidized and then fused with glass in a nickel alloy crucible. The life of the crucible is short, however, and the scale of operation cannot be increased. In Japan, a single-step process was adopted in which an electric furnace was employed. Precious metals contained in the radioactive waste, however, hindered fused glass from flowing out of the furnace, which has resulted in an insurmountable difficulty. Even if the vitrified radwaste could be successfully sealed, the site for underground disposal has not been determined. An underground disposal site must satisfy a variety of conditions, such as the bedrock and relevance to development of other resources, so a suited tract of land is quite difficult to find in Japan. In contrast, approximately 100 sites or 16% of the land are considered suitable sites in the U.K. The Nuclear Power National Plan positions nuclear power as the trump card to counter global warming, and proclaims that a near-permanent supply of energy without CO2 emissions can be secured by achieving the high-speed breeding reactor cycle. The premise to this argument requires the cause of global warming and climate change to be CO2 emissions, however. 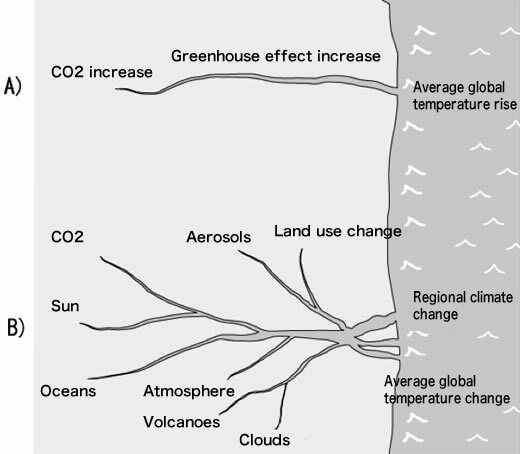 The earth’s climate system is not so simple that a single cause can determine climate change. This issue can be understood from Figure 1. Simplification and idealizing are characteristic of a Western mentality and suited for science, but tend to depart from reality and are unsuited for devising countermeasures. The Eastern mentality, on the other hand, accepts complexity and is suited for devising countermeasures. (A) Single river stream, (B) Multiple branches and delta; A is comparable to the Western mentality with a tendency to simplify and idealize; B is comparable to the Eastern mentality that accepts complexity. The former is suited for science, and the latter is suited for devising countermeasures. As an example of an important factor other than CO2 shown in Figure 1 (B), the influence of solar winds on climate is introduced briefly here with respect to the study of our research group that includes meteorologists. The notion that fluctuations of the sun affect climate is ancient, although meteorologists frequently ignore this, since the change in solar luminosity is small. Evidence of solar fluctuations influencing local climates is not small, however, and some researchers are focusing on ultraviolet rays and cosmic rays. Our group discovered that the north polar oscillation (a type of teleconnection (atmospheric oscillation) where the atmospheric pressure of the north pole and mid-latitudinal regions of the northern hemisphere fluctuate in relative opposition), which imposes a large impact on northern hemisphere climate, had an excellent correlation to the geomagnetic disturbance index. Because geomagnetic disturbances and solar winds are well correlated, we decided to use solar wind data, which is believed to be closer to the inherent nature of this correlation. Fortunately, solar wind fluctuations are easy to distinguish from sunspot fluctuations and easy to analyze. 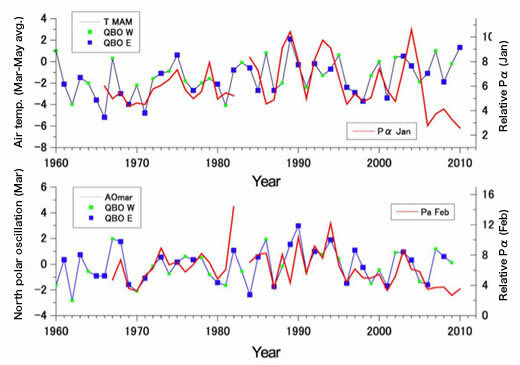 The results of an example are shown in Figure 2, which plots the energy Pα (winter season value) sent by solar winds to Earth’s magnetosphere, the surface air temperature of Scandinavia in spring, and north polar oscillation. The correlation coefficient differs according to the QBO (equatorial stratospheric quasi-biennial oscillation) wind direction, and correlation is high during easterly winds. The coefficient reaches 0.9 or higher under selected conditions. This means that 80% or more of the spring temperature changes in Scandinavia can be explained by fluctuations of solar winds in wintertime. Figure 2. Solar wind may affect the north polar oscillation, and affect air temperatures The upper graph plots the relationship between energy flux Pα taken in by the magnetosphere from solar winds (Jan) and surface air temperature (Sodankyla, Finland, spring). The lower graph plots the relationship between the same energy flux (Feb) and north polar oscillation index (Mar). The correlation is high when the equatorial stratospheric winds (QBO) are easterly. For ultraviolet rays that synchronize with sunspots, the correlation is high for westerly winds. (K. Itoh, Japan Geoscience Union Meeting , 2011). We are moving ahead with similar analyses for the stratosphere and troposphere, where large correlations have been observed. In short, propagation of the solar winds’ effect is becoming proven in the sequence of magnetosphere, stratosphere, troposphere, and Earth’s surface. At the same time, we have found large regional fluctuations, too. Conventional analyses that employ average values or consider solely the effect to the troposphere and Earth’s surface are unable to detect the sun’s climate impact. Of course, the inability to detect is not the same as non-existent. Repeated assertions claim that global warming over the past 100 years was caused by CO2, but I feel it necessary to reanalyze, on the basis of the sun’s influence. Although warming because of CO2 may not be a mistake, its effect in all likelihood is just part of the entire picture. In sum, climate change in the real world consists of many natural fluctuations and human factors besides CO2, which means that CO2 reduction alone does not halt climate change. Climate change countermeasures solely from a CO2 perspective are meaningless. Thus, the existence of nuclear power plants can no longer be rationalized as a climate change restraint through CO2 reduction. Naturally, the debate arises over energy availability, if the nuclear power plants are eliminated. Yet this is precisely the price tag for neglecting research into other energy sources by relying upon nuclear power, as Mitsuo Taketani proclaimed 50 years ago. Realistic answers are available, such as thermal power by coal, for which Japan owns considerably superior technology. Overcoming two major illusions—the nuclear power plant and global warming caused by CO2—are mandatory in formulating an outlook for the future. Kiminori Itoh, Reassurance by knowing these - 50 Questions about Radioactivity and Nuclear Power, Nippon Hyoron Sha, 2011. Kiminori Itoh, Global Warming - Gradually filled Jigsaw Puzzle, Nippon Hyoron Sha, 2003. Kiminori Itoh, Tadashi Watanabe, Global Warming - Lies and Tricks about Global Warming Issue, KK Bestsellers, 2008. Kiminori Itoh, “Mentality of Global Warming Issue - Social Psychological Viewpoint of Climate Change Issue”, Parity, Vol.27, No.01, 90-93, 2012. 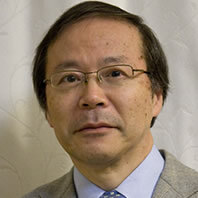 Kiminori Itoh, “Forecast about Problems of the Global Warming Issue”, Chemistry Today, July 2011 Issue, pp.21-26, 2011. Hiroshi Kubota, Creating New Energy Policy Independent of Nuclear Power Plants, The NikkanKogyo Shimbun, 2011.